In recent days a fight has broken out between two of America’s biggest blowhards, Donald Trump and Arizona’s angry old man, John McCain — because this country is only big enough for one prima donna, dontcha know. MCain complained to Ryan Lizza at the New Yorker that Donald Trump has “fired up the crazies” within the Republican Party. John McCain Has a Few Things to Say About Donald Trump. Apparently McCain was upset that “The Donald” is appealing to xenophobia and racism in the GOP crazy base. Well it takes one to know one, Johnny boy. This is the man who inflicted upon America the halfling governor of Alaska, the Quitta from Wasilla, Sarah Palin. 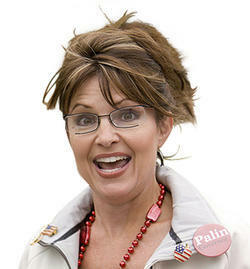 And what was the role of Caribou Barbie during the 2008 campaign? The video from that Sarah Palin rally in Ohio last week probably said it all — that not only are racists herding in John McCain’s direction, but that previously obscured racism among mainstream conservatives is now bubbling up at an increasing rate. I half-expected to hear the same thing from “Joe the Plumber” last week when it was pointed out to him that he would actually get a tax cut under Obama’s plan. It’s clear that the campaign to defeat Barack Obama — which is what the McCain campaign has rapidly devolved into, ever since it became self-evident that McCain himself couldn’t give us a single good reason to vote for him, beyond his moose-in-the-headlights running mate — is in fact creating an environment in which these kinds of sentiments not only are encouraged, but are now considered normal. Donald Trump is just an old male version of Sarah Palin with bad hair. Two years later when McCain was running for reelection to the Senate, he had to do his own dirty work (although Caribou Barbie did make some campaign appearances for him). McCain paired up with “Studboi1,” part-time underwear model and somehow Sheriff of Pinal County, Paul Babeu. Who can forget McCain’s nativist dog whistle “Complete The Danged Fence” – McCain TV Ad? After McCain’s “crazies” comment went viral, things have sorta escalated out of control between the duelling prima donnas. Donald Trump rips John McCain: ‘Dummy!’. At the so-called Freedom Fest in Las Vegas the Family Leadership Summit in Iowa on Saturday, “The Donald” said that John McCain, a prisoner of war in Vietnam, is “a war hero because he was captured. I like people that weren’t captured, OK?” Watch Donald Trump say John McCain is ‘not a war hero’. That was too much for John McCain’s political base — the Beltway media villagers — to take. Chuck Todd, host of NBC’s “Meet The Press” (“If its Sunday, its John McCain”) pronounced that Trump’s campaign is probably over. The reliably Republican Washington Post’s political gossip column “The Fix” similarly suggests that Trump’s campaign is probably over. Donald Trump disparaged John McCain’s military service. Is this the end of his run? Really Beltway media villagers? What “The Donald” said pales by comparison to what George “W’ Bush and his boy “Turdblossom” Karl Rove did to John McCain in South Carolina in 2000, and what they did to John Kerry in 2004 (with your complicit help). Bush Supporters Questioned McCain’s Sanity. Bush Supporters Spread Racist Rumors About McCain’s Daughter. Rove Suggests Former POW McCain Committed Treason and Fathered Child With Black Prostitute. In 2000, McCain operatives in SC accused Rove of spreading rumors against McCain, such as “suggestions that McCain had committed treason while a prisoner of war, and had fathered a child by a black prostitute,” according to the New Yorker. After Rove Denied Role In McCain Whisper Campaign, Reporters Concluded He Was Behind It. Sampley Called McCain a “Coward” and a Traitor. What “The Donald” said about McCain is mildly tame stuff compared to what George “W’ Bush and his boy “Turdblossom” Karl Rove did to John McCain in South Carolina in 2000. The group’s credibility has been challenged due to misleading, false or inconsistent statements. A detailed review of the claims in their book is also available. The SBVT propaganda smear campaign was financed by Sam Fox, a billionaire and hardline rightwinger. The fact that Fox financed this project was revealed during his Senate confirmation hearings to become US ambassador to Belgium. Although the Senate blocked his confirmation pointing out Fox’s pernicious activities, George Bush appointed Fox over the authority of the Senate during a “Senate recess”. Furthermore, the PR company responsible for the SBVT (and whose bill Fox paid) was Arthur J. Finkelstein and Associates run by Arthur J. Finkelstein, the “dirty-tricks guy for the Republicans”. Finkelstein is best know for his black-propaganda campaigns that are primarily character assassinations or smearing — as the SBVT campaign demonstrates. I would hasten to add that the Beltway media villagers were more than happy to aid and abet this smear campaign by giving these Swift Boat Liars an inordinate amount of media coverage, “catapulting the propaganda” as “W” famously said. Delegates to the Republican National Convention found a new way to take a jab at Democratic presidential candidate John Kerry’s Vietnam service record: by sporting adhesive bandages with small purple hearts on them. 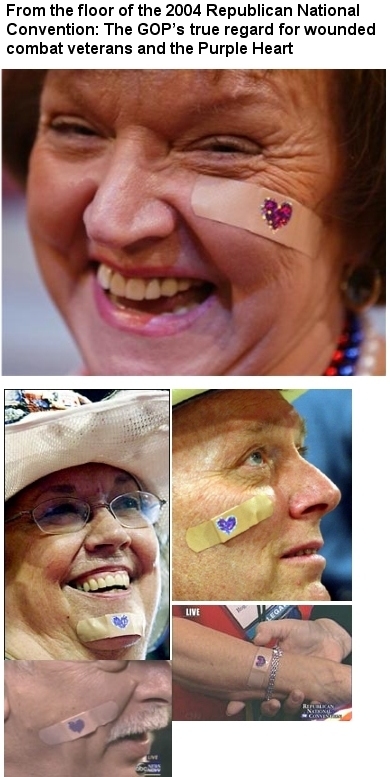 Morton Blackwell, a prominent Virginia delegate, has been handing out the heart-covered bandages to delegates, who’ve worn them on their chins, cheeks, the backs of their hands and other places. Blackwell is president of the Leadership Institute, an educational foundation he founded in 1979. According to its Web site, the institute prepares conservatives for success in politics, government and the news media. Kerry was a decorated Navy officer in Vietnam who became a prominent antiwar activist upon his return home. A group calling itself “Swift Boat Veterans for Truth” has accused Kerry of lying to win combat decorations in Vietnam, including the Bronze Star and the Purple Heart. Sorry, Beltway media villagers, but Republicans disparaging military service is a GOP thing that they have been doing for a long time. What”The Donald” said is mild by comparison to what George “W” Bush and “Turdblossom” Karl Rove have done in the past, with the complicity of you Beltway media villagers. Donald Trump is just carrying on a long tradition in the GOP. There are many in the GOP who probably agree with him about John McCain. I would not prematurely declare his campaign over just because John McCain’s political base — the Beltway media villagers — are offended by Trump’s comments. 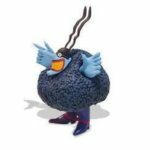 AZ BlueMeanie, I love you! This statement from a man of honor…to one that would never had such kind words for SOS Kerry…and hasn’t, in the past. I wouldn’t have given McCain all that credit, but who am I. SOS Kerry knows of what he speaks. Very kind words for a miserable old man. When it comes to John McCain, I am a bit schizoid, Cheri. On the one hand, I have the highest respect for his service and performance as a Prisoner of War. I don’t know if I could have could have displayed as much courage as he did in that environment and I will always admire him for it. On the other hand, his performance as our Senator for the last few years has been embarassing and abysmal and I have no respect for him in that regard. I just want him to retire and go away. It is a very strange dichotomy. What is interesting about this little kerfuffle is that there are still any Republicans who come to the defense of McCain. Trump is an amusing side story in the 2016 election (or at least I hope he is) so I really don’t pay mu.ch attention to him, but people defending McCain after all the ways he has made an idiot of himself is beyond comprehension to me.